(Nanowerk News) Silicon nanowires have a great deal of potential in future high-performance electronic, sensing and energy devices. Red photoluminescence has been reported in silicon nanowires, but for many applications this hampers device performance. As Tsuyoshi Okuno from the University of Electro-Communications and his colleagues point out in a recent report ("Correlation between photoluminescence and structure in silicon nanowires fabricated by metal-assisted etching"), "Although the photoluminescence mechanism is often discussed, the condition of the appearance and the absence of the red photoluminescence is rarely reported." 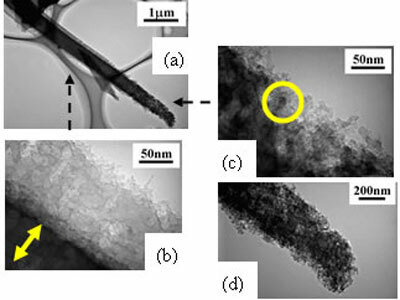 Transmission electron microscopy images show a silicon nanowire (a), a zoom in on the interface between silicon crystalline core (arrow) and surrounding silicon oxide in the middle part of the nanowire in (b) and a zoom in on the top end (c) and (d). The circle in (c) shows an example of silicon nanocrystals. Okuno and his colleagues fabricated silicon nanowire arrays by metal-assisted chemical etching, an approach that is simple and cost-effective. They deposited metal nanoparticles on a silicon wafer and etched nanowires using aqueous H2O2. Although the researchers did not have precise control over the nanowire morphology, they did observe that higher concentrations of H2O2 led to thicker nanowires. Photoluminescence studies did not reveal a link between photoluminescence and nanowire diameter or length alone, but low aspect ratio nanowires exhibited red photoluminescence. Further observations of the morphology identified silicon nanocrystals at the nanowire ends, which was corroborated by Raman studies of single nanowires. These nanocrystals disappear on annealing, as does the red photoluminescence. The researchers attribute the red photoluminescence to defect states between nanocrystals and surrounding oxide, and excitonic transitions. As the researchers conclude in their report, "These results of Si nanowire arrays are believed to be useful for future optoelectronic and photovoltaic applications."